Subtitle: If this Ashland shooting is determined to be part of the Beltway Sniper, is a new occult symbol being formed on the ground in such a way that it touches the Left Hand Path point of the pentagram? The Goatshead of Mendes pentagram on the ground north of the White House gives us useful guidance. NEWS BRIEF: "Man Shot in Ashland, Va.; Police Investigating Whether Attack Is Sniper-Related", Fox News, October 20, 2002. "ASHLAND, Va.  The task force investigating the Washington, D.C.-area sniper attacks headed to Ashland, Va., Saturday, where a man was shot in the parking lot of a Ponderosa restaurant. Authorities said the victim, 37, and his wife were walking to a car behind the restaurant at around 8 p.m. when he was shot in the abdomen. Ashland Police Chief Frederick Pleasants said after dining at the restaurant for about an hour, the man's wife heard a sound, but didn't recognize it as a gunshot, then saw her husband take about three steps before collapsing ... because the bullet remains in the victim, police have not given any ballistic evidence to the Bureau of Alcohol, Tobacco and Firearms, and whether they will depends on the doctors' assessment of the man's condition." "Lt. Doug Goodman, spokesman for the Hanover County sheriff's office, said there is no physical evidence yet connecting the attack to the other sniper shootings. 'We are not taking any chances. We are deploying our resources as if it's connected. Better safe than sorry', Goodman said." 1. The Method of Operation (M.O.) of firing out of heavily wooded areas is the same as has been seen in most other shootings. Wooded greenways have lain adjacent to most of the other shootings, thus giving the sniper maximum protection, plus providing him the ability to break down his sniper pistol or short rifle, hide it in bulky clothing, and then walk out rather than ride out in a vehicle. 2. The date of this shooting was 10/19, which equals an '11' -- 1 + 1 + 9 = 11. The number, '11', has been very apparent throughout this shooting spree, as our other articles have demonstrated. However, if this shooting was timed to form another "9/11" message, is this shot the first to establish a new occult symbol on the ground, possibly symbolically connected to the pentagram? 3. The Ashland, Virginia, restaurant at which this shooting occurred is at the Route 1 exit off I-95, in conjunction with Route 54. This location is exactly 33.0 miles south of the last fatality, which occurred south of Fredericksburg at the exit of Route 1 and I-95. In the world of the Illuminati, few numbers are more precious than a "33" [11 x 3]. This exact distance of 33 miles between Shot #11 of the pentagram and what may be the first shot of another symbol seems highly significant. 4. The name, "Ashland" may hold serious significance to the Illuminati, as well. The word, "ash" in the town's name may refer to the the ashes of the Phoenix Bird, for after a Phoenix Bird voluntarily undergoes self-immolation, its body is reduced to "ashes"; out of the ashes of that dead body, a new Phoenix Bird arises. Our original occult Founding Fathers were told by their demonic guiding spirits that the symbolic national bird was to be the Phoenix Bird! Even though the symbol was changed to the Bald Eagle because of fears that too many Christians would recognize the Egyptian Satanism inherent in the Phoenix, the occultist well understood that the original symbolism held true. Thus, we published articles explaining the significance of the fact that Hillary Clinton, plus many Democrat and Republican ladies, began wearing Phoenix Bird lapel pins in 1999. Just last year, we published an article reporting that Laura Bush sent out Phoenix Bird Christmas cards to the Republican faithful women of Texas last year! Ashland, Virginia, might very well be a play on the "ashes" of the Phoenix Bird! 5. The victim who was shot was just going about his daily, everyday routine! If ever there has been a common thread to these previous shootings, this is it. People have been gunned down who are totally unrelated to one another, who were minding their own business, and who were going about everyday activities. Since the shooter was just required to create a fatality at a particular location, he did not care whom he shot, just so long as the fatality occurred at the right geographical location. 1. This shooting is not part of the Beltway Sniper shooting profile, and was not carried out by him. As of the moment this article is going to press, police are stating that they have no physical evidence to say conclusively that this shooting was carried out by the Beltway Sniper. 2. This shooting is part of the Beltway Sniper. We have noted, above, our belief that it may be related, for the five reasons we have listed above. If the Beltway Sniper carried out this attack, we must now ask ourselves how this relates to the Pentagram on the ground formed by the first set of 11 shots, 9 fatalities [eliminating Shot #1 as most police and media agencies are now doing]. If the date of this attack is forming another "9/11" message, it strongly implies that a new set of shootings may have started that may begin a new symbol on the ground that is symbolically connected with the last fatality in Fredericksburg. This shooting, in Ashland, Virginia, is exactly 33 miles south of the exit in Fredericksburg at which Shot #11 occurred. Thus, you could state that the first point of this new symbol is symbolically linked by a straight line from Fredericksburg to Ashland. Is there an instance already established where Satanic symbols are linked? Indeed, there is, right in Government Center, as explained in NEWS1399. 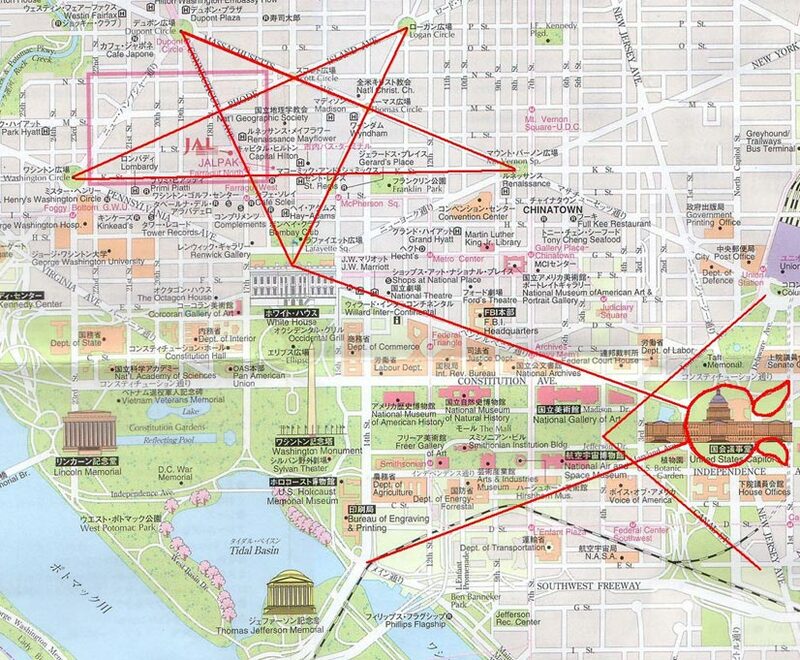 The key street map demonstrating how different Satanic symbols have already been placed on the ground is proven by this street map of the White House and the Capitol. Remember that this layout was planned in 1791. Note that the single point of the Goatshead of Mendes that located at the White House is linked by Pennsylvania Avenue to the Capitol. This line that links these two government institutions is actually part of the Freemasonry Compass, with Pennsylvania Avenue forming the left leg of the compass. Similarly, the Ashland shooting location is located directly 33 miles south of Shot #11 south of Fredericksburg! A former Satanist asked me early last week if I had any idea how many shootings were planned; when I answered in the negative, she said, "The Goddess Kali wears a necklace of 52 human skulls; I think this shooting spree might have 52 shots. I replied, "God forbid"! Yet, I wonder. We shall just have to wait to see how this shocking and tragic scenario plays out. Truly, these are wicked times in which the Illuminati is working overtime, as the final terrible birth pangs to create Antichrist are occurring in our Daily News!